Perfect for a '32 Ford! The new All American Package is a complete, self-contained instrument panel featuring unique LED internal lighting for night driving. The package includes: An electronic 140 MPH speedo, fuel, volt, temp, oil gauge and a complete wiring harness. Integral turn indicator lights and odometer, plus the polished All American trademark emblem are built in. 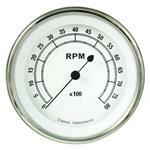 Measuring 5" x 12.25" overall, this exclusive gauge package will look great in any hot rod, classic truck or custom. This assembled kit was honored with Best New Product of 2005 by NSRA!! 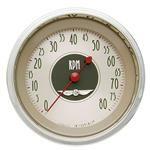 Old Tyme White II Instruments from Auto Meter aren't your grandfather's gauge! While this series of instruments may not look all that much different from the traditional gauges of yesterday due to period correct styling and subtle touches like domed lenses and scalloped chrome bezels, the difference is in the details. Built with fully modern gauge internals with the level of accuracy and performance demanded by top racing teams across the country, these instruments are more than just a pretty face. When the sun goes down and the lights turn on are when these gauges really shine! Powered by Auto Meter's latest generation white LED backlighting for a full dial glow, making them some of the most visible gauges in the marketplace today! Nothing says "hot rod" like a tachometer strapped to the steering column or perched atop the dash. 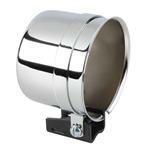 This chrome-plated mounting cup accepts 3-3/8" tachs and will help you mount your tach where you want it. Works well with Classic Instruments and Omega 3-3/8" tachs. Stewart Warner 366ADB Electic Speedometer Adapter for Ford Trans. Adapter is necessary when using a Stewart Warner Wings electric speedometer with a Ford automatic transmission. Required for use of an electronic speedometer with Ford automatic transmission. More info on Stewart Warner 366ADB Electic Speedometer Adapter for Ford Trans. 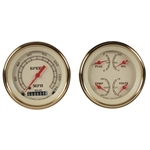 These Classic Instruments Vintage Series Quad Gauges feature 24 carat gold plated bezels with parchment faces and brown numbers with old-fashion style red pointers. 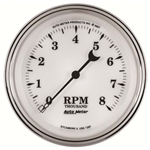 This Classic White Series tachometer from Classic Instruments features an polished stainless steel bezel with white face and black numbers and pointers. 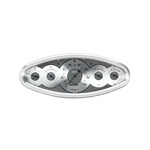 Authentic-style gauge set includes an electronic programmable speedometer and a 4-gauge cluster. Includes hard-couple pulse speedo sender, fuel level gauge with 6-24" adjustable sender, oil pressure gauge with sender, water temperature gauge with sender, and voltage gauge. 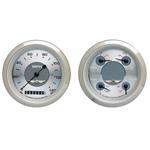 Both the speedometer and gauge cluster measure 3-3/8" in diameter. 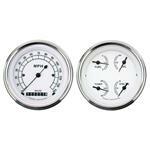 More info on Classic Instruments VT02GLF Vintage Series Quad Gauges, 3-3/8 Dia. 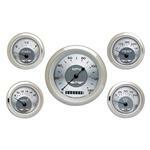 These Classic White Series gauges from Classic Instruments feature polished stainless steel bezels with white faces and black numbers and pointers. 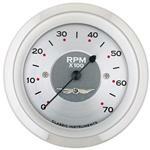 Authentic-style gauge set includes an electronic programmable speedometer and a 4 gauge cluster. Includes hard-couple pulse speedo sender, fuel level gauge with 6-24" adjustable sender, oil pressure gauge with sender, water temperature gauge with sender, and voltage gauge. Classic Instruments teamed up with Tom Gale, who was Chief Designer at Chrysler, to produce these beautiful gauges. They feature curved glass, polished stainless bezels, a raised logo, and a vintage appearance that incorporates the unique look of spun metal. Included is a 3-3/8" speedometer and a 3-3/8" quad gauge with GM style sending units (included). The fuel sender is 240-33 Ohm. Auto Meter has hit a home run with their new American Muscle gauge kit. The distinctive look features LED illumination, glowing red pointers, chrome bezel and spun aluminum dials. 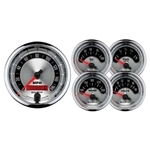 The five gauge set includes a 3-3/8" electric speedometer and 2-1/16" water, oil, volt and fuel gauges. 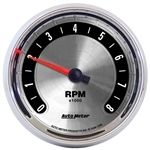 Auto Meter has hit a home run with their new American Muscle gauges. The distinctive look features LED illumination, glowing red pointer, chrome bezel and spun aluminum dials. 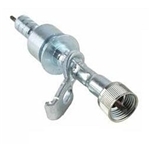 3-3/8" diameter, 8,000 RPM. Operates on 4, 6, or 8 cylinder engines with points, electronic, and most 12V high performance racing ignitions. Classic Instruments teamed up with Tom Gale, who was Chief Designer at Chrysler, to produce these beautiful gauges. They feature curved glass, polished stainless bezel, a raised logo and the vintage appearance you are looking for. The tach is 3-3/8". Classic Instruments teamed up with Tom Gale, who was Chief Designer at Chrysler, to produce these beautiful gauges. They feature curved glass, polished stainless bezels, a raised logo, and a vintage appearance that incorporates the unique look of spun metal. The speedo is 3-3/8", while the rest are 2-1/8. They come as a 5 gauge set that includes GM style sending units. 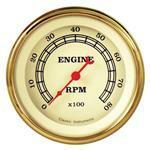 Won’t this gauge look sweet in your Ford hot rod? 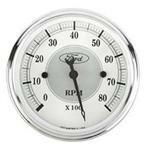 This 3-1/8" diameter Auto Meter tachometer has a vintage look that includes the Ford logo. 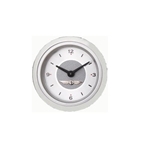 Features a vintage-style domed lens and white gauge face. Designed to mount into your dash.